Imagine flying at 200 feet above the water for hours at a time while hunting submarines. Now imagine that there was a time when you couldn’t actually do the flying and had to sit in the back and make pancakes in the back for the rest of the crew. Because after all, pilots gotta eat! This is just a small and funny glimpse into the live of Jeffrey Graham. Jeff is a United States Navy Aviator. 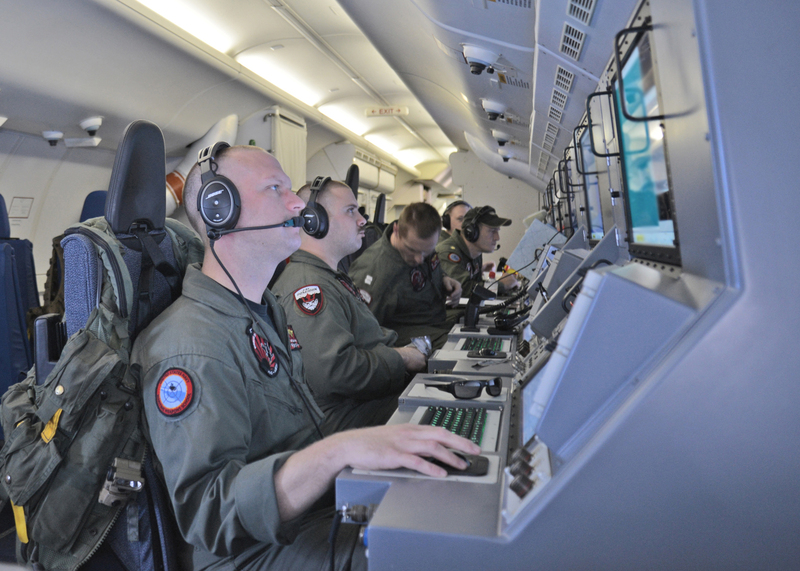 He has flown long hours on station with the P3 Orion, and is now training to instruct others on the P8 Poseidon. Both of these aircraft are part of the same mission, but only the P3 has been around for a long time. In fact, Jeff’s father flew the P3 when he was in the Navy. That’s old! The P8 on the other hand is a handy new platform. Believe it or not, it’s a Boeing 737 modified to carry out the duties of sub hunting, surveillance and more. That’s a big upgrade, and one that Jeff gets to be a part of. With all of that cool stuff going on, Jeff’s journey to the Navy wasn’t the most typical. He started his drive for the Navy late in his college career when his grades were suffering and his ambition for anything other than soccer non-existant. After getting a fire inside to get to the Navy, Jeff put in the work, popped up his grades, and aced the exams to get into a Naval Aviator track. His story is one we can all relate to, and enjoy listening to. Thanks for your service and dedication, Jeff! Huge thanks to Jeff. Good luck with the P8! We expect periodic updates on your progress! Sub hunting at 250 knots and 200 feet. This is AviatorCast episode 73. Chris: Welcome, welcome, welcome, aviators. You’ve landed at AviatorCast. My name is Chris Palmer. I think often of why aviation is something that is a deep part of me. The recurring reasons I keep coming back to are that it makes me a better me — something that I have to strive for, improve and all of that with great humility. Up there in the rare air life often makes the most sense. Although aviation isn’t the God I worship, it is certainly something that makes me feel closer to God. Welcome to this, the 73rd episode of AviatorCast. I am absolutely excited to have you here. I’m coming to you from Angle of Attack Studios in beautiful Alaska. It’s beautiful here every time of the year. Yes, even in winter but this time of year it’s green and warmer and we’re enjoying our summer here in the Midnight Sun. AviatorCast is a podcast that we bring you each and every week. We’ll talk to inspiring aviators, interviewing them, learning more about their careers, their challenges, adversities that they’ve overcome to get to where they are and the passion that they still have for their jobs. Then we’ll get into some insight into aviation. Maybe there’s little areas, little dark corners of aviation that we’ll learn a little more about. Maybe something that we haven’t learned about before and you’ll definitely hear a lot of that today if you aren’t too familiar with military aviation, so some of those new insights will help you. Maybe you have lost the passion for aviation. You’re just looking to re-ignite that flame. That is another thing we talk about. We’re all about passion here on AviatorCast. We believe that passion is at the core of being a pilot and so we like to talk about it a lot. We throw the “passion” word around a lot. Maybe you are a new pilot and you are looking to get the courage to fly and you want the tools in order to go out and afford it and get the time to do it and those sorts of things. These are the sorts of topics that we often touch on this and many more. We even talk about flight simulation quite a bit on this podcast, as we believe that in today’s day and age, flight simulation is such a huge part of staying sharp as a pilot and even becoming a pilot. It’s just such a great tool, so we often talk about that as well. On today’s episode, we have a very special guest. We have Jeffrey Graham who is a Naval Aviator. I met Jeff when I went to SUN ‘n FUN in April. It’s great to meet him. He was standing next to a beautiful P8. If you don’t know what a P8 is, just imagine a 737 that has been retrofitted and specially built to hunt submarines. That is what the P8 is. That is something that Jeff is currently learning to fly, learning to instruct on, all those sorts of things. Pretty cool airplane. We’re definitely going to be talking a little bit about that in this episode but we talk more about Jeff. Jeff was, you will learn, someone that did not take school seriously, ended up having to take it seriously if he wanted to get into the Navy, ended up going through some courses of action that led him to the point where the Navy brought him in, in such a great fashion that he eventually got selected to be in Fighter School or as they call it TAC Air School. From there he faced more adversity where he had some physical thing where he ended up having to move over to the less aggressive aircraft in multi-engine category and that’s kind of the transport category of the Navy. Very cool story there. Great connection to a lot of us that face those sorts of things from day to day. The things that keep people from flying are health and money. Those are the two biggest things, so it’s really cool to hear Jeff’s story of getting through at least one of those, the health thing. Pretty cool. It’s definitely a cool part of the story and not the biggest part of the story. Overall, he just has a great look at being in the military and going the military route. 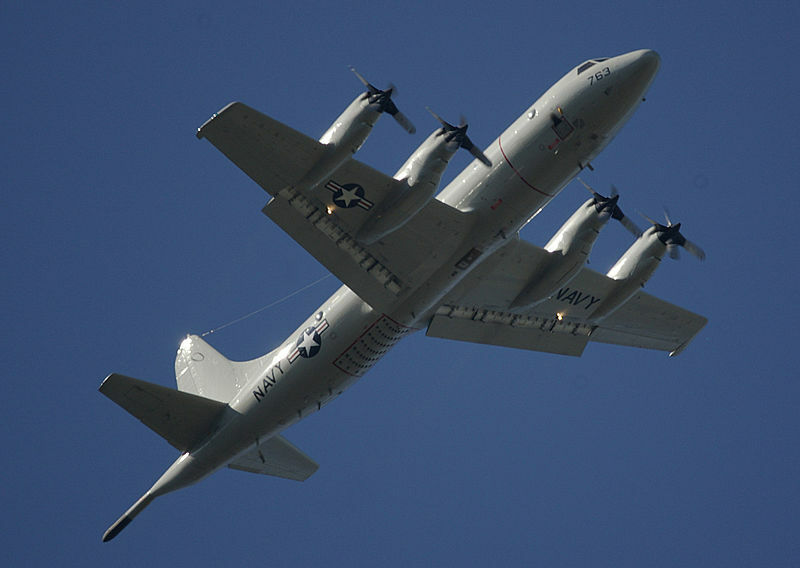 From there, he learned how to fly and flew quite a bit from my understanding, the P3 Orion. 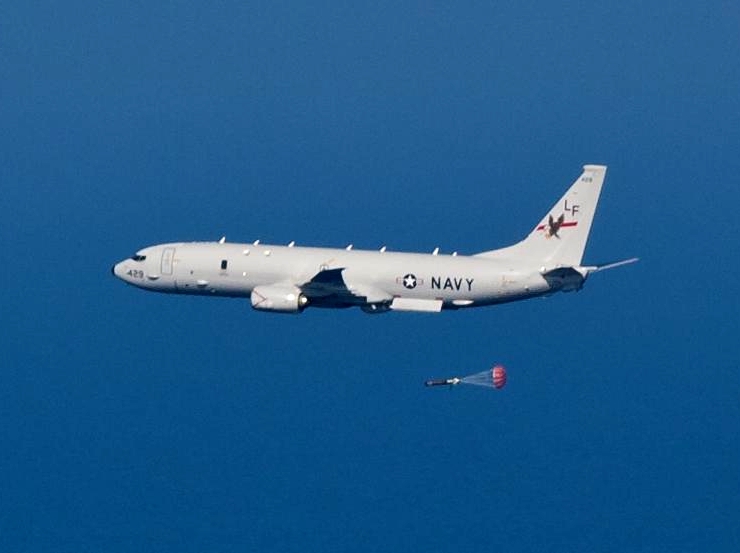 That is a long-standing submarine hunter for the US Navy but now the US Navy in some squadrons they are switching to the P8, which, as I mentioned before is the 737 version of the sub hunter. If you can imagine flying a 737 200 feet, 300 feet above the water at 250 knots hunting submarines, that is essentially what Jeff does. Pretty amazing. That’s what we’re going to be talking about today on this interview with Jeff. As always before we get into that, we have a review that comes to us from iTunes. If you want to leave a review on iTunes and I end up reading it on the show, I will send you a free AviatorCast t-shirt irregardless of where you are in the world. Thank you, Sal Thiessen. Really appreciate it. I’ve got a t-shirt that would be coming your way soon. We’re just finishing those up and we’ll be sending them out soon. I can’t wait to actually get this t-shirt thing done. I know I’ve been talking about it for a while but I’m excited about it. Going to send one your way, Sal Thiessen. Make sure to send me an e-mail at me@aviatorcast.com. We’d love to send one out to you when those are available here in the next few weeks. I’m just punked about that. That’s it. If you want to leave a review, be sure to do that on iTunes. I’d really appreciate it. Let’s get into this episode of AviatorCast. Let’s talk to Jeffrey Graham about his naval aviation career. Here it is, Hangar Talk with Jeff Graham. Chris: Alright everybody, we are honored to have a very special guest with us today, Jeff Graham. Jeff, welcome to AviatorCast. How are you doing? Jeff: I’m doing great. Thanks for having me, Chris. You wrote me back and you were there with your squadron and everything. We ended up meeting each other, face to face next to a very noisy I don’t think it was an APU or anything but something was going on in the P8 that we were standing next to but we were still able to have a good conversation. Here we are. We finally set it up. We’re doing our episode. Jeff: It took a little time to get our schedules together but yes, it’s nice to get it taken of. Chris: Yes. You’ve been busy, too because your wife graduated from…what did she graduate from again? Jeff: She graduated from AMU, American Military University and with her Masters. She’s got a Masters in Classical and Ancient History. Chris: Tell us the elevator pitch, who you are and what you do. We’re going to obviously unfold that throughout the show but give our listeners a little glimpse into what your profession is. Jeff: Yes, sure. I’m a Navy pilot, a Naval Aviator. 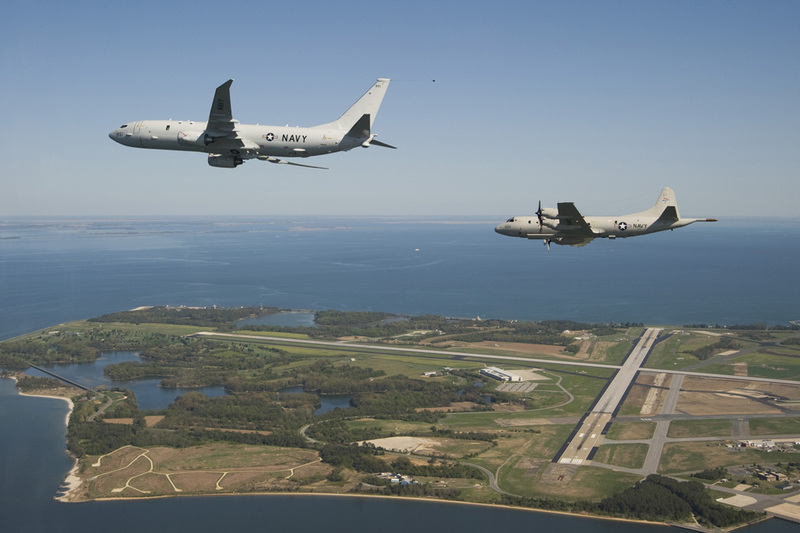 Throughout my training I’ve learned a number of different aircraft as all Naval Aviators will and I kind of settled down into maritime patrol. 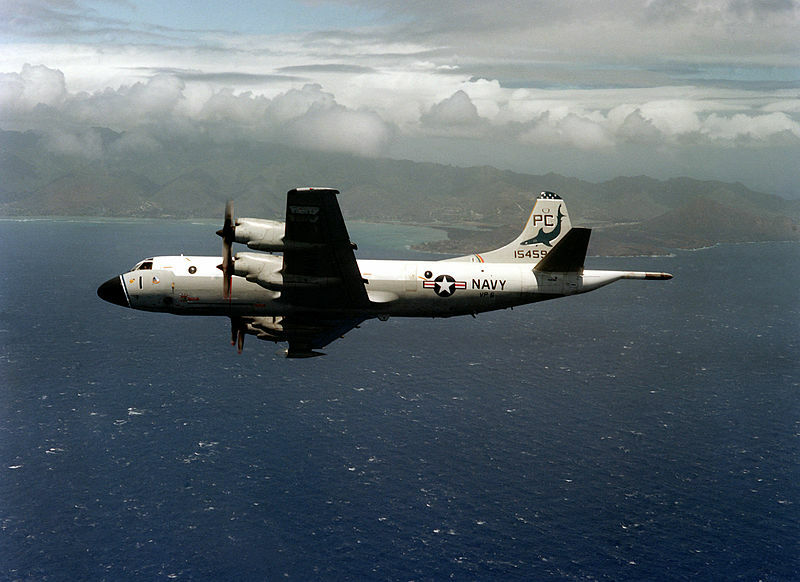 Initially, the P3, larger aircraft, land-based and four engines turboprop and our main mission is submarine hunting. It’s kind of a mission that not a lot of people know that the Navy does. From our land-based airstrip, we would fly out. The typical mission may be a thousand miles away from home. We’ll fly out at altitude and then we’ll drop down to about close to 200 feet. A P3 typically, if we’re doing a search we may be around a thousand feet and then as we gain contact on the submarine we may go a little bit lower. Our minimum altitude is around 200 feet. We spend a lot of time down there. I did a full tour of that up at Whidbey Island in Northwestern Washington, just a little bit north of Seattle. Three and a half years of that, two deployments. One to Seventh Fleet, what we call it, to Kadena in Japan and then I also did one to Qatar and Bahrain. I got some, what we call visually flying as well. Now I’ve moved on from my sea tour, we call that first flying tour to my shore tour and I’m at the FRS now, Fleet Reserve or as we say hip replacement squad right now where I’ll be teaching some of the new guys that will be going out to their fleet squadron, their first time in the plane. Now that I’ve gotten here where I’m transitioning to the new aircraft, the P8. It’s a military version of the 737. We’re teaching these new PAT1s, we call them to fly the plane the first time and then get them through to aN ATACS qualified co-pilot and then get them out to the fleet, so they can start training their fleet squadrons. Chris: That P8 is a great looking airplane. It’s really interesting that they took a civilian platform like that and brought it over to such an intense military application but then again it’s really not that surprising because it’s really always been done. You look at the 707, which became the KC-135. You look at the 767, which has become an air re-fueller. It’s not uncommon for that to happen obviously. I guess it just surprised me in the case of the 737 because it’s not really a big airplane but it ends up being for at least the purposes you guys are using it for a pretty good platform to work on. Jeff: Definitely, yes. Boeing has built in a lot of stuff for us but it is very, very similar to a commercial 737. I was telling all the guys that came up to see at SUN ‘n FUN, it rolls off the same line as the rest of their commercial 737s and then they just kind of roll it up the street to their PA hangar and then it takes them about a month extra to hang all the extra stuff on it. They’ve given us some extra NIAs capability and then obviously we’ve got some of the things that we do that the commercial side wouldn’t do. We’ve got our ability, delivery system, we got weapons and things like that. The P3 was a commercial aircraft as well. That was a Lockheed Electra. Chris: I never made that connection. Jeff: It looks quite a bit different. They chopped, I believe it’s Seventh Fleet out of the fuselage forward to the wing. I guess they shortened the platform and then they hung, if you’re familiar with the P3 they hung a boom off the back, a magnetic anomaly detector. Chris: Yes. That’s pretty iconic for the P3. Jeff: It is. Definitely, yes. They hung that out there and then all the various mods that we’d gotten over the years and hard points on the wings for weapons and that type of thing but it is yes, a Lockheed Electra modified. Chris: Wow. Yes. I had no idea. Very cool. I’m just looking at it here now. 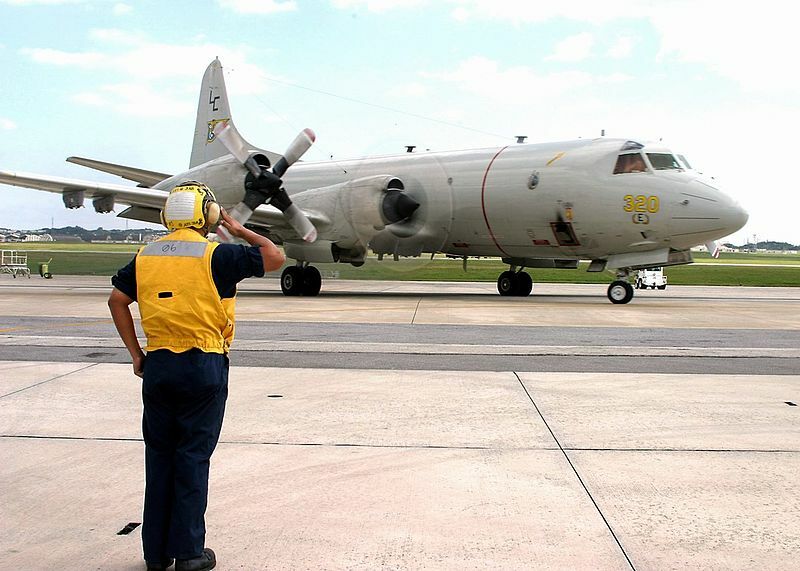 I remember this aircraft type because when I was a little kid I was huge into Micro Machines and I just remember having the coolest P3 Orion, P3C Orion I think it even designated. Jeff: That’s the variant that we’re still flying today, P3 Charlie. My dad actually flew it. He was in the Navy as well and he flew the P3 also. Chris: Let’s rewind a little bit. Let’s come back to these airplanes because this is a fun conversation. I want to learn more from you about kind of the differences, even the differences between the P3 and the P8 and what the mission of the P8 will be versus the P3 and so on but kind of rewinding your life a little bit and speaking to even your father a little bit having flown the P3. Tell us how you actually fell in love with aviation. I always take every interviewee back to that time and I like to find out what happened then. How did you actually fall in love with aviation and decide this was something that you were going to do? Jeff: Well, it took me a little bit longer than I think some people would have expected to be honest. Like I said, I’m a son of an aviator. He was a P3 pilot and he currently flies for American Airlines now. I was born after he began flying, so I’ve been around aviation since I was a baby. I moved around with him a little bit although he was mostly done moving around by the time I came along. I was born in California and then we moved briefly to Japan. He was transferred to the Dixon River in Maryland and that’s where I spent most of my life. He was in a reserve squadron there. We did the thing that all military families do; went to all the air shows, he’d take me on the flight line and show me things. When he was with American, he’d take me down in the bowels of the airport up there and show me some planes and some stuff like that and even to the point where they always say “Top Gun” was one of the best recruiting moves that could have happened to the military. I used to watch that movie, probably was not age-appropriate at that time but when I’d come home from elementary school I’d pop it in pretty much everyday. I had planes as toys and things like that. I bet if anybody had seen me then they kind of would have assumed that I would eventually get into this line of work. I don’t know. I kind of moved away from it. I started playing soccer and soccer was a big part of my life all the way through college. When it came time to decide where to go to school, I was looking at some places around and I wasn’t heavily recruited or anything but I was looking at some places that maybe I could walk on and my sister was at the vet school at Virginia Tech. I looked in. I was like, “Well,” part of my decision was going to be how far away it is. You don’t want to be so close to the parents that they’re always visiting but you don’t want to be so far away that they can’t go there on the weekend or so. That was five hours away from my parents, kind of a sweet spot there. I wasn’t real sure what I wanted to do but I knew I was good at science and math, so I thought about maybe Engineering and Virginia Tech’s a great engineering school. I applied really there and that’s about it. I guess I also put an application to University of Virginia and I got in but didn’t really pay it much attention. Virginia Tech was where I wanted to go. I went there and ended up playing soccer there for a few years. All of a sudden it was the beginning of my senior year. I most likely wasn’t going to be a professional soccer player, so I had to figure out what I was going to do with myself. I had spent the first three years playing soccer and not paying a whole lot of attention to my grades. They weren’t so good. The recruiter took a look at my transcript and said, “Well, what do you want to do?” I said, “Well, I thought about maybe flying.” She says, “You’re not going to be competitive.” I said, “Okay. Well, what’s the problem?” She said, “Your GPA is too low.” I was sitting at a 2.8 or so which is admittedly pretty low. Chris: Pretty average I would say. Jeff: Yes. It wasn’t going to do me any favors to get me into Officer Candidates School. Chris: Yes. Not in the Navy it wouldn’t. Sure. Jeff: I said, “Okay. Well, what if you just give me the entrance exam?” They’ve got the Officer Candidates School Entrance Exam and then the Aviation Test Battery. I was like, “I promise you. I’ll ace this exam, just give it to me.” She wouldn’t even let me take it. Jeff: Yes. So I said, “Okay.” I went home and I called up my parents and I talked to Dad. I said, “Hey, I went to a Navy recruiter today.” He goes, “You didn’t sign anything, did you?” I said, “No. I didn’t sign anything.” He goes, “Okay.” We talked about it. I think he never really had mentioned going to the Academy or anything like that. I think maybe he was afraid of kind of pushing me one way or the other even what he had done on me. He had gone the other direction. He didn’t really mention it. I had even had a gentleman when I was a senior in high school. He had come and asked me. I was playing on an adult soccer team. He had come and asked me, “Hey, I think you could play soccer at the Academy. You want to go?” I just right up and said, “No.” I didn’t even really consider it. Jeff: I could have saved myself some heartache and some time. Here I am my senior year and I’m now in the Statistics Department at Virginia Tech instead of Engineering for various reasons. That kind of goes off on a tangent we can get into later if you’d like. Either way I’m in the Statistics Department. I’m trying to figure out what to do. I made a deal with him. I said, “Hey, if I get A’s in these classes, will you admit me to the school for a Masters’ program?” He said, “Yes. Sure.” Next fall, I took those courses. After my senior year I took those courses and I said, “I got A’s.” He said, “Okay. Well, we made a deal. I’ll let you in the school.” He even actually gave me assistant chip there, which meant the school would pay for half of it and I’d act as a teacher’s assistant. It worked out really well. I took out some loans, which I ended up using for about ten hours worth of flight training. I thought maybe it would help boost my application when I eventually put it into Officer Candidates School. I did some various things here and there. It really worked out well for me. My wife, I had met her my junior year and it was her freshman year. She was two years behind me anyway. When we looked at how her final years were going to go, we weren’t sure how that was going to work out and then it ended up me being in school at Virginia Tech still. Jeff: It worked out great really in the end to stay there and get my own Masters plus now I’ve got a Masters. That’s one of the stepping-stones as I moved through the Navy here, some furthering education. I’ve already got that. I don’t have to worry about that at the moment. It really worked out kind of well but it did cost me a little extra time. Now I’m two years later than most people trying to get into the military. Most guys coming out and go to Officers Candidates School and go in it 22 years old, not at 24. Jeff: Not a huge deal but two years I could have been working towards something but it is what it is. It worked out well. I went back to the recruiter after about a year of my graduate studies, gave the new recruiter my new GPA with graduate classes where I’m looking at 3.5, 3.6 or something like that. He said, “Oh yes, certainly.” Gave me the test. I did remarkably well on the test and application went off and did my entrance interview like you have to do. They accepted me and I was in, I guess that would be August of 2007 when I went off to Officers Candidates School. Chris: The thing that I recognized from that story and I think that the listeners can gain a lot of insight into it as well is the fact that you kind of started off in a sense where you weren’t necessarily setting yourself up for where you needed to be but to me it seems that you got creative about what you needed to do to get yourself there; like going to the Dean of that part of your school and talking to him and coming up with a plan there and also talking to the recruiters and finding out what you needed to do. You came up with a plan and then you went out and did the work to make it happen. I think the listeners they may be going into the military, maybe not; definitely civil aviation is much the same where the top-notch people get the top-notch positions. It just seems like a success principle to me. That’s one thing and one attitude that you need to have in order to get yourself where you need to go. Chris: Well, very cool. I like that part of your story because it definitely already shows that there are things you have to work toward to get where you needed to be. What was the next step from there? Obviously you set yourself up and now you’re in Officer Candidates School. First of all, tell us about what Officer Candidates School is and how the unraveling of your flight experience starts from there because that’s really when you start…well, maybe not in that particular school but you’re going to start flying sims. Everyone wants to hear about that. Get us to that point in your story. Jeff: Yes, definitely. Officer Candidates School and it changes throughout the years. It was Aviation Officer Candidates School when my dad went and it was down in Pensacola, down there with all the other aviation stuff that really goes on initially in the Navy. Since then, they have moved it up to Newport, Rhode Island. I actually came in with the first class, the new Officer Candidates School in Rhode Island. They’ve got a lot of schools up there like prep schools and things like that. I was getting ready to go to the academy and they’ve got ideas, Officer Development School and things like that. They just felt that they should put all the schools together. It’s a kick in the pants, the Candidates School is. It’s run by Marine Drill Instructors and they are, from what I understand it may just be a rumor, the word on the street is they are some of the top Marine Drill Instructors. They get them up there. I tell you, I’d never been in such good shape. I came out of there running five-minute mile and being able to drop to a hundred push-ups in a set. Jeff: It’s unbelievable really, the kind of stuff they put you through. We did rifle drill. We did midship classes. We did a number of different things. We did some leadership development. We did obviously the physical side of it. We did all the room, lock and personnel inspection. We call them ROPs, at least we did when I was there, room, lock and personnel inspections and a lot of being able to think while doing something physical. That was their big thing. Whether it be yelling a response back that was phrased correctly and all the things we had to memorize there. We had little knowledge books that we have to carry around. It was like rank structure and like [Inaudible][0:28:12] and these types of things that…well, the rank’s there. That’s a pretty good rule in our life and so many things. There’s rote memorization and they’re simply to make sure you can do work while being sleep-deprived. Typically, we’d get only a couple of hours of sleep at night for weeks at a time because we didn’t have any free time to work on our rooms, to work on our homework, to do things like that. We were constantly either being PT’d, physically trained we call it getting beat; either getting beat, being in class or eating from probably 6:00 am till 10:00 at night and then the time from 10:00 to 6:00 was the time you had to work on other things. It could be writing letters, doing homework and getting ready for an inspection, that type of thing. We typically only slept a few hours a night for about I guess it’s probably nine weeks before you get out of those phases. You need to have your wits about you while you were sleep deprived while somebody is in your face yelling at you while you’re being physically trained and while you’re providing the appropriate volume back at that person but they do a pretty good job of indoctrinating you there. Once you get through Officer Candidates School, it’s 12-week long then they send us down to Pensacola, the Aviation Academy. We get started into API, Aviation Pre-flight Indoctrination. That’s where we get out all of our basic classes. We’ll take navigation classes. We’ll take aerodynamics and safety courses, a number of different courses for, I would say it’s about six or eight weeks long, something like that. It’s also where we do our initial water survival training. You can get videos of this on YouTube and stuff like that. Some things that we had to do there included the helo dunker which if you’re familiar with naval aviation you probably heard some stories about it. It’s essentially a mock-up of a helicopter and they had it in this big indoor pool. They load about eight people up at a time in it in different seats that are mocked-up as if you were sitting in an actual helicopter. You’re supposed to note where the exits are. What they do is they drop it into the pool, flip over and then you have to get out of your seatbelt and work your way through an exit. Chris: Yes. I’m looking at that now. That is crazy. Jeff: It’s an impressive piece of equipment. I mean, it’s a large mock-up of a helicopter and it’s in the middle of the pool and they flip it over in the water. They kind of build you up. They’ll give you goggles as you’re doing it for the first time anyway. They give you goggles, so you can see what you’re doing and then they’ll run you through it with blacked out goggles and then they run you through it with no goggles. They move you around in different seats, so you have to figure out different exits and things like that. That’s one of the best that we got to do. We got some underwater puzzle solving and things like that. We have to drop down underwater, follow a rope to a simple set of levers and things like that and you’ve got to operate all the levers to get the door open and go out the underwater door and then come to the surface, that type of thing. Chris: Can you hold your breath for a really long time? Jeff: It’s not so much that as being able to stay calm while you’re holding your breath. The puzzles, they all really only take…going down and following the rope and then going through the puzzles really only takes 20 or 30 seconds but some people aren’t comfortable being underwater and having a solid plate of Plexiglas in front of them that they can’t get out and not being able to think through those puzzles. Chris: That is unnerving. Wow. Jeff: We’ve got a high dive. You got to jump, I think it’s 30 or 40 feet into a pool. I think without…we had boots on I believe. You got to do it in the appropriate form. It’s supposed to simulate jumping off a ship. Underwater to a black line is about, oh probably 20 yards away or so and then it’s supposed to simulate jumping off of a ship into water that may have oil burning on the surface. Chris: Yes, burning. I figured that would be it. Yes. Very cool. Jeff: We do a mile swim just to test endurance and that type of thing. Also, we do a couple of variations of swimming in flight gear and getting picked up by simulated helicopters. We’ve got a harness that we wear with our flight gear, so that if we are ever, if you actually get ejected over water, you’re in a P3 and you need to bail out, you know the proper way to get picked up by helos without hurting yourself. Jeff: It’s some of the best training. It seems like a lot of hard stuff but it’s some of the best training that the Navy has to offer. 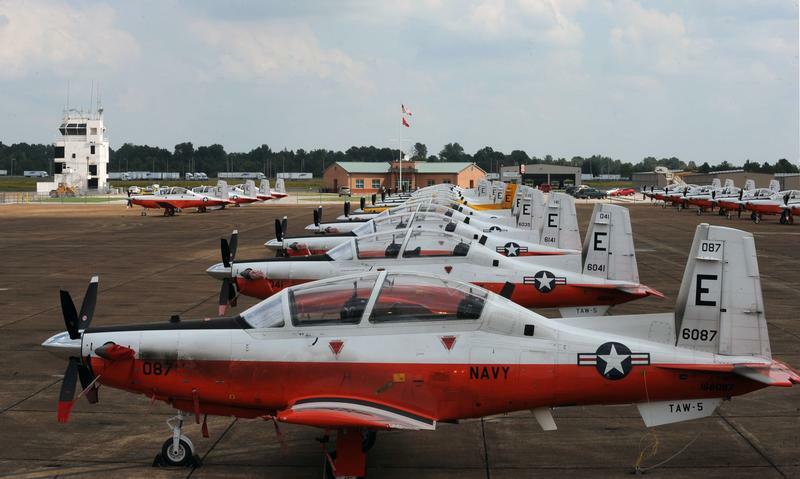 From there, you’ll go to your primary squadron which is either in just north of Pensacola at Whiting Field in good old Milton, Florida or they could send you down to Corpus Christi where they’ve got some primary squadrons down there as well. I was a T34 when I was there. They’d since switched to the [Inaudible][34:16] which is a high-performance aircraft, still a single engine turboprop like the T34 was but it’s got about double the horsepower and ejection seat and [Inaudible][34:29] that type of thing. Chris: Yes. Those were cool airplanes. Jeff: They are real cool airplanes. The T34s when I got there, man they were old. My dad flew those as well. Jeff: They were old to the point where if you were the last part of our emergency procedure, if you were in a spin once you open the canopy, you’d get out on to the wing and jump off. Jeff: That was old technology we were working with there. It was a persistent little aircraft. You can do a lot of things with it. You can do a lot of things in smaller space. 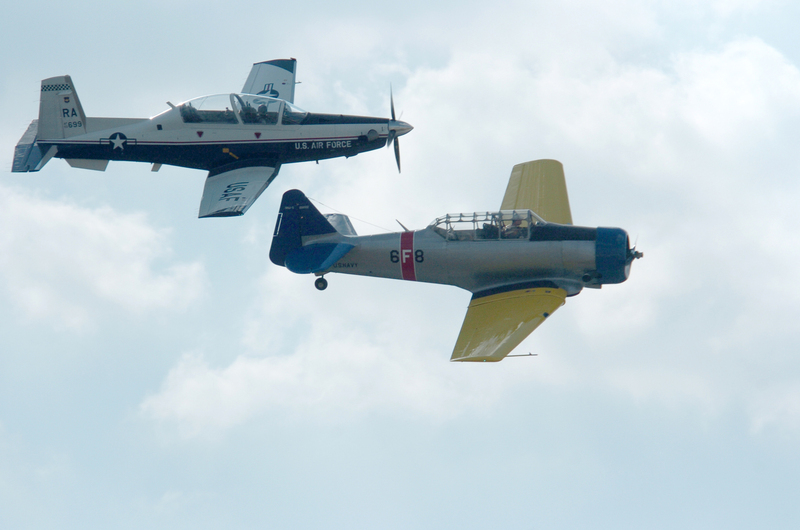 For example, the T6 requires I believe 6,000 feet to do a loop and we can do it in a thousand critical feet in a T34, which is pretty cool. That’s where we do most of our initial flight trainings. You get your first flight there really and first, they call familiarization where you go through your first takeoff, your first climb out, your first checklist and go out there and maybe you’ll spin the aircraft or stall it or allow it to do some touch and go in some of the outlying fields, something like that. You move through a bunch of familiarization flights which are supposed to ideally get you set up to take your first solo similar to civilian flying. You go through a bunch of early flights out there with a flight instructor and they get you set up there to go out and do your first solo flight. I believe there were nine flights before your solo when I was there. Chris: How long is flight typically? Jeff:About two hours typically, depends on the weather out there. If you were having bad weather, if you were there during the summers, something like that, we have always gotten short. I think they wanted a minimum of 15 hours before you went out and get your solo but that’s just coming from memory. Chris: The crazy thing there is that civilian pilots like me will initially say, “Well, 15 hours that’s pretty average or even 20 hours. That’s nothing special. I thought this is the Navy or whatever.” You got to realize that these guys, they’re not doing this in 172s or 152s. This is a very high-performance, very fast airplane, complex right out of the gate. That’s amazing. It’s amazing the military is able to do that sort of training, that condensed training. If that was just an off-the-street civilian pilot, it would take them 50 hours to solo or something crazy. Jeff: Right. These are real, like you said complex aircraft, tractual gear like it comes with speed props and all that, like you said high-performance. There’s one thing I can say. We joke a lot about military intelligence and all that but the Navy’s been doing flight training for a long time and they’re good at it. The stuff that they have been doing for a long time, they are very good at it. They know what works. They know what doesn’t. 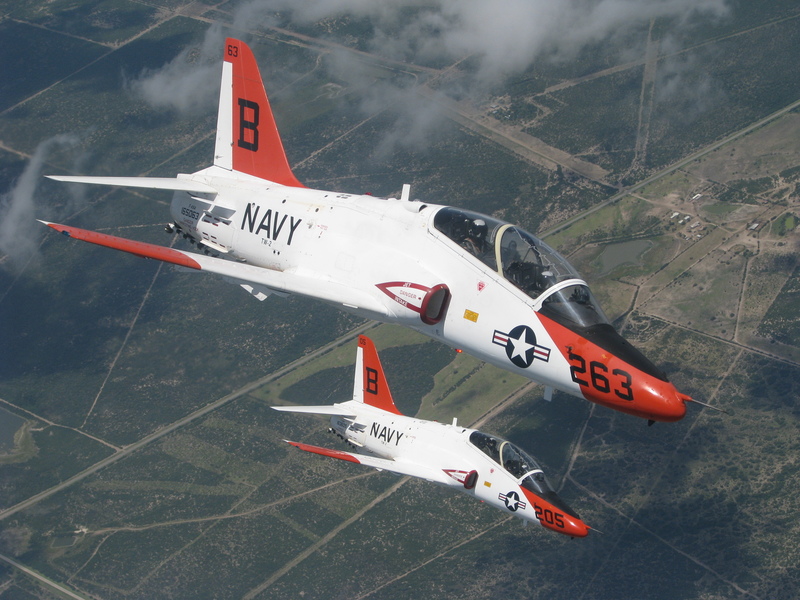 I see that moving to a new airframe now, one that the Navy just got. We’re still figuring things out, figuring out how best to teach these new PAT1s that are coming through, whereas on the P3 side because we’re still training some P3 pilots, on the P3 side of the house they’ve got it locked up. They know exactly what they’re doing. Everything is regimented and everybody is successful because they know what they’re doing. Chris: From a training perspective, the interesting thing there and one thing that I think is a detriment to the general aviation community in the way they train is there’s a lot of scattered information and there’s no one source to get that information. Obviously, there are the regulations and the manuals and all those things but it seems like a lot of the tribal knowledge that the military would hold and pass down to their pilots is lost just from instructor to instructor in kind of the messy way that happens in general aviation. Yet, in the military I think one of the big reasons why they’re able to train so effectively is all those little pieces of information and the deep knowledge of the airplanes and all those things, they’re passed down in a very structured and useful way to where you guys really do know the airplanes. You really do know how to effectively train the pilots, whereas obviously in the civilian world that isn’t that tight. It’s not that structured. I think that’s a big reason why, too. Jeff: Right. For us it’s always what goes around comes around. I always was told when I was going through my primary instructor…as you go through each phase of training, we have what’s called an arm wing and he’s an instructor and he’s your primary inspector. You’ll do events with other instructors but you may do half of your events with this one particular instructor. They’re kind of like a mentor through the flight training process. He said, “You’re probably going to be here in my shoes one of these days.” I said, “No. I don’t really want to go in instructing. I want to go fly and we’ll see where it takes me. Instructing may not really be the thing I want to do.” Now here I am at the FRS being an instructor. We know what we pass down is going to become a background here in another four years. These guys that we’re teaching, these guys are going to be back here as instructors. The idea is that they are better than us when they get here. Passing down all that info, making all of the products that we have; we’ve got our flight manual, we call it NATOPS. On the P3 side, they’ve got what they call a job aid which is kind of like taking the systems, taking the procedures and bringing them out in plain English so that they’re easy to understand and tweaking all those products so that the junior aviators coming up are better than we were when we got there. Then when they move through the pipeline, they’re better instructors than we were when they get there. Chris: Maybe that’s it right there. The perception that “When I pass down this information, I want that next person to be better,” because in the civilian world when someone gets a CFI ticket it’s generally just their next step to building hours or whatever it is. I think sometimes it’s not taken as seriously as it should be. It’s cool to hear that perspective from you on how you guys do it. Jeff: Yes. These guys most, I should say are very professional about sharing information. I think depending on where you’re going in the civilian world sharing things, we call them HASREPs, I’m not sure of the civilian equivalent but, “Hey, we went out. We did this. Maybe we messed up some of the procedures, maybe we didn’t but we had this issue.” It’s a way to kind of put out all that information to the rest of the fleet in a non-punitive way. It goes out and that’s one of the things that we review all the time. Chris: Alright. Now that you’ve gone through that initial training in the Texan which by the way I was lusting over it while looking here at it online. Actually, I remember when I was doing some training in Wichita I remember these suckers flying around in the factory and it’s just super cool. Anyway, now that you’ve gone through that, what’s the next step and where did you go from here did you get from this cool little hot rod and the challenges there and really the primary training that you’re going through there into eventually getting into the P3? Make that transition for us. Jeff: Okay. As you move through primary training, you get a score. They call it, and now it’s like a combination score of a bunch of different things, they call it NSS or at least they did when I was there. It’s essentially matching you against the average of maybe the previous say, 300 or 400 pilots and then the average of the pilots that are currently with you in training. This is how they rank you out at the end of primary flight training. You can put in like a dream sheet where, “Hey, my first choice might have been TAC Air and then my second choice multi-engine, third choice helo,” or something like that. 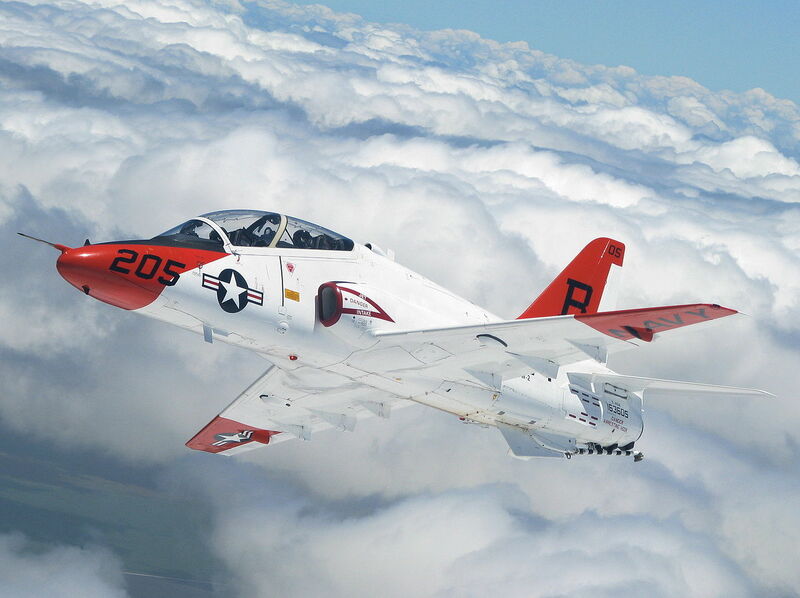 Chris: TAC Air would be fighter pilots, right or fighter aircraft? Jeff: Right. Yes. Yes, those that fly off the carrier. As they rank you out here, you tell them what you want. The Navy will obviously prevail but if they have room for you where you want then they can send you there. Then they go down the list as you ranked out, that type of thing. I selected TAC Air out of primary. That was what I wanted. I had a pretty good score and they have room for me. My next stop was Meridian, Mississippi. They’ve got T44s up there. They had transitioned a few years earlier from the old T2. T45 is British-built, the Goshawk. They go and you go up there. You get your instrument card in the Goshawk and then do some tactical training, learn how to fly a jet, something that’s high-performance, single engine, all the propulsion coming from the exhaust right behind you instead of being pulled forward by a prop. That’s an interesting transition being all the thrust coming from behind. The plane is real squirrely. You got to really stay on top of it but also the high-performance nature of it, you’re walking into something that you know is twice as fast and twice as maneuverable as with what you just came out of in the T6 nowadays. It’s a fun little aircraft. I had to get time in it. 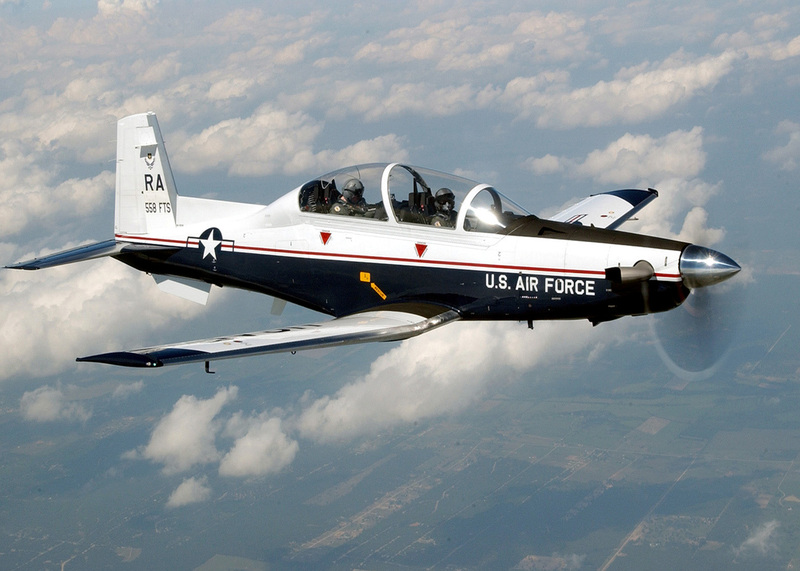 What was happening to me was as I was going through the FAM phase in the T45 I had done most of my instruments training and I was going through and I was working toward a solo and I was finding that I was having a lot of airsickness issues. I have had some of those during primary. What they do during primary is they sit you on this chair; they call it the spinning puke. It’s essentially a drag racing chair bolted to a motor, which can spin you. They put you in it. There’s a flight surgeon there that this is his specialty. This is what he does. It’s just a job. You go through a series of head movement basically trying to make your inner ear get used to turning in multiple axes at the same time. They’ll spin the chair and have you move your head on a different axis, just to acclimate you to it. I sort of acclimated. They also can give you some medication for a little bit. It’s essentially Dramamine and speed. They bring you down and then get you back up to a level where you can function and fly the plane. It promotes or takes care of the airsickness but you can’t stay on it indefinitely. You certainly can’t solo on it. I basically went up to the point where I was vomiting on every flight, up to the point where I had to not to solo on time. I kind of choked it back on that flight when I was able to solo. I ended up being able to solo on time. I did my aerobatics. I was able to get through. After that it was all instrument flights during primary. Now I’m here at Advanced and there are not too many things that you have to do with a jet where you don’t roll it quickly. You don’t want to put negative Gs on a jet. If you want to push the nose over, what you would do is roll it to 180 degrees and pull and then roll it back. That didn’t work out real well for me. The following week I did two flights a day. For that whole business week we go out on form flights and then as the two planes would, one plane would break up and go do something and I’d be left with the instructor in the other plane. He’d give me the controls and say, “Alright, go make yourself sick.” I’d do everything; put on Gs, takeoff Gs, all sorts of stuff, unload the plane, whichever I could deal with. I ended up narrowing it down to a rapid roll rate. The doctors would later tell me that they think there’s an issue with my eyes. If they don’t follow the roll rate quickly enough like a normal TAC Air aviators’ would and that was making me sick. It was sending some weird signals to my inner ear and I was getting sick every time I rolled the plane quickly. I came back at the end of that week. I said to the TO, Training Officer, “Hey, TO. I figured out what it is. I think it’s the rapid roll rate and it doesn’t seem to be getting better. What are my options here?” He said, “Well, we can try to work it out of you. If it takes some time, take some time. That’s fine. No big deal.” I was doing pretty well in the program. One thing he cautioned me about was I have to do some non-flying tours during my career and if I ever become non-acclimated, he has known people in the past who have gotten sick when they come back from their flying tours and then they have immediately been cut from the flight program and they go to a desk job. I didn’t really want that. That shook me up a little bit. I said, “Hey, what about some other platforms?” They gave me the opportunity to go get on an International Guard AC135 that was coming out of the Meridian Regional Base there. It’s also an International Guard Base. They sat me in the jump seat there. I went and did a normal bounce flight. I don’t think they went down to golf court and got a bunch of touch and gos in and that type of thing. I did the normal maneuvering and all that. Then I came back to the Flight Surgeon. I told him, “Hey, I didn’t have any issues on this flight.” He said he’d sign off on my medical paperwork that I could continue flying but in another platform. We started getting the paperwork going to transition to multi-engine. While I’m definitely not the first person to do that transition at all, it’s not very common. I had to figure it out on the fly, figure out what kind of paperwork we needed, what kind of timeline it was going to be. We ended up, in all at Meridian including that training and then working through the paperwork about eight months. I had orders down to Corpus Christi. Corpus Christi is where they do all the multi-engine training. If I had selected multi-engine directly out of primary, that’s where we would have gone. We just would have gone straight there. Now we’re down there and going through…they fly the T44 down there and also the TC12 although I think they’ve started to phase those out. The T44s are King Air and its being retrofitted with some glass cockpit stuff and that type of thing. It’s an excellent airplane. It’s old as well. My dad flew that one as well. We go through some of the stuff that you can’t get in a single-engine plane. We go through asymmetric thrust type things. We obviously go through all the new systems in the new plane, that type of thing, engine out stuff up high. We talk about engine out on the runway, engine out, single-engine landing, that type of thing. We go through also and get our instrument reading as Naval Aviators. That’s usually about six month’s worth of work. That’s when you get your wings as a multi-engine aviator. You get your wings down there in Corpus Christi. I got my wings finally in May of 2010, almost two years after starting flight training and then we went out to Jacksonville, 3FRS which is where I am now. I went there as a CAT1 and started learning to fly the P3. P8 was not yet online. It was all P3 training there. They take us, as CAT1s they take us from the King Air, which is a complex aircraft, and it’s bigger than say, the P34 or the T6 but still not a real large aircraft. We go and get our first time in the P3. We introduced some cool things in the P3, some stuff that I didn’t know at the time but I’ve come to find out since it’s not very common. Big, four-engine aircraft, the P3 is and we’ll do things, when we train engine out on the runway…well, actually induced a legitimate low-powered situation by using, by the instructor FP manipulating some bleed air things and inducing a low power on one the engines. We’ll do an actual abort with a low power on one engine, simulate shutting that engine down and reversing with only the three good engines which I guess is not super common in aviation. Chris: No, not at all. Yes. That’s something that they would maybe do in a simulator. Yes, you would never do that. Jeff: That’s how we do it in the P8 now. When Boeing was shopping the P8 around to us way back when I guess they took some rides in the P3 to see what we were doing for training. They told us that we will not be doing this type of thing in the P8. While we’re up in the pattern, we may have simulated an engine failure and we would do that by pulling one of the engines back to idle and then we would do a three-engine landing, with only three good engines, with one of those, the fourth one back at idle or sim an engine failure after refusal for us, so I guess that would have put [Inaudible][53:53] for the civil guys. To simulate that as instructors we would just pull it into back at 100 knots because our simulated refusal for training mission, we would pull an engine back up to idle and let them correct for the change in thrust and then takeoff on three engines and then handle whatever simulated emergency they gave them. Chris: Wow. With the P8, Boeing basically said no way. You can’t do that? Jeff: Yes, pretty much. That’s my understanding. I’m hearing it third or probably fourth hand. They were like, “You guys cannot do that with this plane.” We do all of our engine work, engine out work in a simulator. Chris: Yes, yes. That’s pretty difficult. It makes sense. You’ve only got two engines. Why mess with one of the two good engines? Jeff: Right. It was cool at times obviously. The P3 is an overpowered airplane. Because the props are forward to the wing, it doesn’t take much pull up at all to get that prop moving again. Once you got that prop moving, it’s introducing almost artificial airflow over that wing. As soon as you get those props moving even if you haven’t increased air speed at all, you’ve got about eight knots of extra air speed going over that wing. You can wave off not at all gross weight, but a lot of gross weight you could wave off with two big engines. The wave off performances, hitting those stall recovery was good although we didn’t take that plane all the way to stall. As soon as you put power on that plane, you were flying again. Jeff: It’s pretty cool. It’s a hardy bird, the P3. It survived a lot. Got a soft spot for it in my heart I think even though I’ve moved on to something bigger and better. Chris: There’s something cool about it. From what I understand, too, just speaking to one difference between the two and you can correct me if I’m wrong but the P3 is more low altitude, right whereas the P8 is more high altitude? Is that correct? Jeff: It is in a sense. Those are what they’re best at. The turboprops are more efficient down at low altitude than the turbofans are on the P8. We would spend more time down low in the P3 than we will in the P8. We can do our RAS, our submarine work there in the P8. We can do that from higher altitudes based on some of the extras here that we’ve got on the plane. We will still routinely go down to 200 feet in the P8. Jeff: Yes. If we’re tracking something and we’re simulating attack or any event that they have to actually attack a submarine, they’ll most likely be down to 200 or 300 feet when they do it. Chris: Just so everyone understands, imagine flying a 737 at 200 feet above the water. How fast do you guys go when you’re doing that? Jeff: We’re usually somewhere in the area of 250 knots or so. Chris: Okay. Goodness. That’s just weird to me because you would never ever do that in a civil airplane. You’ll lose your job instantly unless you’re landing or something. That’s just crazy. Jeff: Yes. It’s definitely something that a lot of people don’t know that we do. In the P3, as we said we spend more time down low. It may be if we’re working on a submarine and the squadron is providing 24-hour coverage on a submarine, it may be if it’s 500 miles away from base we may spend six hours down that 300 feet tracking that sub. Chris: That’s some busy flying, too because you can’t autopilot at that altitude, right? It’s all hand flying. Am I correct in that? Jeff: You definitely can. In the P8 at the moment based on some of their restrictions that we’ve got because it is a new airframe, we cannot use the auto-pilot down quite that low but in the P3 we had some pretty good auto-pilots well-tested and we would use them if they were available. We often took a plane without an auto-pilot and then you would be hand flying down at 300 feet but if the auto-pilot was available, that would obviously take a little bit of the load off which is key if you’re talking about providing 24 hours worth of coverage on a submarine. Some of those crews are going to be, for example coming in at maybe 8:00 or an 8:30 brief pm to takeoff at 11:30 and then they wouldn’t get on station until maybe 1:00 am. Then they’d be in station until 5:00 or 6:00 am. It’s nice to have that little bit of load taken off if you can have the autopilot. We have had issues, some issues with the autopilot. Sometimes they click off. Sometimes there’s an issue with the autopilot. You got to be ready to take it obviously but it’s not quite the [Inaudible][59:24] hand flying it can do. Chris: Right, right. Not as much fatigued. That’s why I was going after that. Gosh, if you had to hand fly while you’re loitering for six hours or whatever or even more, that would be exhausting. Jeff: Right and then you add to it say, if you were looking at maybe a ten-hour mission instead of a more reasonable eight, you get to go out there and you got to be on station for a certain amount of time and to do that you got to save a lot of gas. We would even shut down one of the engines out on station. We may fly around 200 or 300 feet tracking a submarine with one of our engines shut down. Chris: Wow. Crazy. Okay. How do you guys eat when you’re on station for that long? Jeff: Obviously we got to bring stuff with us. A lot of places will have a flight line kitchen but they’re typically not very good. What we would do, usually either the 3P or the FEs, the junior pilot or the junior flight engineer, typically the junior pilot because he’s got less responsibilities during pre-flight and that type of thing; we kind of nominate him to be the cook. We would collect money from the crew either on a weekly basis or what have you and they’d go and get stuff to make a meal on board. Back in the galley we’ve got some outlets. We got some hot cups and a fridge. We usually go out. The 3P, he’d have the little 3P kit. We’d have a rolling cooler and then among the 3Ps in the squadron we’d probably have, we’ve got 10 crews, so ten 3Ps, probably we’d have four or five crockpots, four or five griddles, that type of thing. Barbecue is something a lot of the crew like because it’s easy on the 3P. It’s always delicious and it can just sit back there and stay hot. Get a piece of pork and some barbecue. Put it in the crockpot, plug it in right on pre-flight and then halfway through the flight, it’s usually ready to spread and eat. People would bring…I’ve done pancakes. If we’re back there and typically the 3P is in a seat for the takeoff because they’re gaining experience in that type of thing, which means when you get to on station, you’re usually out of the seat. I’d go in the back and mix up some pancakes. We’d be down 200 or 300 feet and I’d be in the back of the plane with my LPU or my life preserver on because we have to wear it below a thousand feet. I’d be back there with the griddle plugged in flipping pancakes for the rest of the crew so that they could eat when they had a chance. Chris: 200 feet above the water flipping pancakes. Chris: Way to start. That is awesome, man. I want to eat barbecue like fresh barbecue some time when I’m flying. I know that I’ve cooked it in the airplane. That just seems like the best of both worlds to me. Jeff: Oh, yes. Some of the 3Ps would get really creative. I had some, when I was a 3P on my deployment to Seventh Fleet I’d go out and get some of those Oscar Mayer carving boards, chicken strips or whatever and some frozen veggies and some mozzarella cheese and some whole wheat rolls and I’d make chicken filler sandwiches. Chris: That’s so funny. Okay. You could almost make a cookbook for this, right? It will be the most popular cookbook ever. Jeff: You definitely could. In fact, we had plans to do a competition. We’d get all the 3Ps together and give them what we would have on a plane and we’d do some team-building out there and have them cook meals for everybody. We ended up not getting it together though but that would definitely something that would get a bunch of people together. Chris: Yes. I can see that becoming a big tradition if someone started it. All right, let’s get back to airplanes again instead of food. To be completely honest, it’s 1:00 pm now and I haven’t eaten anything all day, so I really don’t want to talk about food right now. Chris: Let’s get to the P8 because I’m interested in this platform a little bit more. You gave the good synopsis of it earlier. To the extent that you can share, I know that a lot of the information about it you can’t share probably, to the extent that you can share, tell us what the P8 will now do over top the P3. What new additional capabilities that you guys are getting out of it? Just give us a little more information on the P8. Jeff: Okay. The idea that Boeing sold us on was that it was going to be able to complete all the missions that the P3 could. As such, ASW had to be our primary focus on this plane. The systems that they gave us, they improved some reliability. They gave us some different ways that we can do things for example, the sonar buoy launchers. The way we’ll track submarines is we’ll go out and as I’ve said, we’ll drop down low and we’ll deploy sonar buoys which are essentially microphones that will drop down into the water and if there’s a submarine close enough, we’ll hear the submarine noise that the speaker will pick up that submarine noise and send it back to the plane. Our operators in the back will look at that noise. They’ll look at the frequency. They’ll look at how loud it is. They’ll look at what bearing it is from the buoy. Based on the buoy field that we put in the water there they can get a good position on that sub. As our position changes over time we’ll get a good position course and speed on it. One of the things that Boeing gave us, we used to have a bunch of holes in the bottom of the plane for our sonar buoys on the P3. They’ve eliminated that. We only have a few now. We’ve got some rotary launchers in the back. They function kind of like a revolver. We can load up ten sonar buoys in each of these three rotary launchers. They’ll act like a revolver. They’ll spin to make a buoy available and they’ll go out. You’ve only got one hole versus 30 or so at the bottom of the plane. *Jeff:** Yes. It’s definitely a unique solution to the problem and it’s improved the reliability though we’re still working some kinks out on those particular launchers but I think once we’ve got all that done, I think that’s going to be a more reliable system. Jeff: We’ve got all the avionics up front that a modern commercial 737 800 has plus a couple. The old P3 did not have all of those and for example, we did not have TCAS on the P3. Chris: TCAS, EG, what is it? EGPWS, is that right? Yes. Jeff: Yes. We definitely did not have GPWS or anything like that. We didn’t have any of the terrain avoidance that we’ve got on modern airliners. We didn’t have the traffic avoidance which coming from the P3 and then now I’m flying in similar airspace in the P8, I’m looking at the TCAS display and I’m seeing the number of traffic that is around me that I was blissfully unaware of in the P3. It’s amazing. Chris: I’ve experienced that a little bit with even private aviation. It’s kind of unnerving. Wow! I did not know about any of these guys before. It’s kind of crazy. By the way, it has taught me a new term, GPWS. Thanks for that. Jeff: There you go. We got to shorten it. We don’t have any time to say the full acronym in the Navy. Chris: Yes, always military terms. I love it. Jeff: Some of the evident things that we can do in the P8, we can fly higher. We can go farther. The legs are a little bit longer though the endurance time is about the same. What they have given us is the ability to refuel in air which is [Inaudible][01:08:11] and so it’s obviously going to extend our availability on station, not indefinitely obviously but a fair amount. My understanding and I don’t have this on any good authority, so don’t take it as gospel obviously but I believe this thing will stay airborne for 24 hours before we start to break down the oil. Jeff: With the air refueling capability which we’re not utilizing yet though we are starting to train to it, we’ll be able to increase our time on station in which it decreases the number of assets in the theater. Chris: Really that’s how new the P8 is? You guys are still figuring out a lot of those, doing a lot of those things for the first time? I thought the P8 had been out for a while already. Jeff: It has been. I want to say we got our first P8 delivered to our test squad in 2010, about five years but we’ve only transitioned about a quarter of the fleet so far. We’ve made one deployment I believe, possibly in the middle of our second one with P8. The fleet squad really hadn’t had it for very long. It’s new enough that we didn’t even have, our flight manuals we call them NATOPS, obviously another Navy acronym. Those are kind of what we live and die by. Those are all of our operating procedures. It describes all of the systems. It describes how to operate all the systems, how to use the system in certain cases and that type of thing. We didn’t even have an actual NATOPS. We had a preliminary NATOPS until I believe it got approved December of 2014. It really does not have much on the area of air refueling because we haven’t done any yet with it unless maybe some of the test squadrons are doing it but we are starting to train the formation flying in the P8. We had one of our first few flights fly over and do a break in formation the other day. Jeff: It was pretty cool to see, two 737s flying probably 30 feet from each other. We don’t get that close with Angle of Attack guys obviously. Chris: Sure. Yes, that makes sense. Jeff: Yes, it was pretty cool to see that. We’re doing our first form flights, just kind of building up some instructors on it first. We haven’t started doing those things yet. Eventually, after we get our instructors pull up on it we’ll start moving it out to teaching some of the fleet squadrons and then we’ll start teaching some of the CAT1 students. We’ll start working with some tankers and start exercising the air refueling capability. Jeff: We’re still definitely working through some stuff. In fact, we can’t use…it’s new enough we haven’t gotten FAA to approve us using the TARA function of our TCAS. We can only look at traffic alerts. We can’t get resolution alerts yet. Jeff: It’s all there. It’s the same box that you get from that goes in any other 737 but we haven’t been approved to use it yet inside of American airspace. Chris: Interesting. Wow. Interesting. Huh! That’s all very insightful. It just makes me think that these things take time. It’s cool that you guys are taking time getting it right. Coming up with a good training program is not an easy thing to do. Those great training programs that are out there, obviously the military is one of them but speaking to civil aviation as well will take years to develop good programs. Jeff: Definitely. We go over to the Air Force side because they’ve been doing some air refueling in the larger aircraft already. We send some of our instructors there to learn how to do it from them and now they’re coming down and we’re going to implement a similar program here. Chris: Very cool. Wow. Well, gosh. I told you at the start of the show that we’re going to do only 45 minutes. I think we’re pretty far over that now. Let’s wrap up the show. How I want to wrap this up is obviously you have a pretty cool story and you’ve faced some challenges along the way with what had happened in college when you weren’t maybe paying enough attention to what you’re going to be doing after college like you should have and then getting your career back on track to the point where you could join TAC Air in the Navy which is no small thing. Once in the Navy having to go through your motion sickness or airsickness thing, that has to be really rare by the way, that roll rate thing. It has to be really rare. Jeff: Yes. I haven’t spoken to anybody else that’s had that particular issue. Typically, you have some motion sickness at the beginning of your primary flight and that type of thing. You don’t run into too many people that it doesn’t just plain go away on. Chris: Yes, kind of a unique issue. What I want to wrap up with is what is your encouragement for younger people that are out there, possibly looking to get into the military, maybe the Navy specifically and just your encouragement in general for those looking to fly? What would your words be for these types of listeners? Jeff: I guess what I would say is aviation, I can’t speak highly enough of it. It’s, man, it’s a cool thing to do. It’s interesting. It’s got to be interesting to a lot of people even if it’s not their career. It’s an interesting thing to talk about. There’s a lot of problem solving involved. Working through that type of thing is going to benefit you. The aviators I work with come from all walks of life. We’ve got the joke, people that come out of the Poli-Sci program at the Naval Academy, Poli-Sci and flight, they got a degree that would get them through the Naval Academy. We’ve got people that are English majors. I’ve got a friend of mine who went to the OCS with me that went civilian, went to Embry-Riddle. He was an airline pilot and then decided that the airlines weren’t for him and now he’s flying F18s for the Navy. Jeff: Yes. He did really well in his pilot training and his previous hours helped him. The other thing I’ll say is I had maybe five or ten hours before I started applying for the Navy and I ended up doing well, too. It’s not necessarily something you need to go out and spend a ton of time building hours. Obviously, if it’s something you’d be interested in, you’d give it a try a couple of times. It’s not something that you’re necessarily, “Well, I did this, so I’m not going to be able to have a career in flying.” There’s a lot of people from a lot of different backgrounds that are making this a career and being very successful in it. It’s essentially once you are in the community; it’s a bit of a brotherhood. There’s a lot of camaraderie that goes along with taking 300 people in the example of a DP squadron, taking 300 people and going to say, a base in Bahrain and operating a 60-year old aircraft on station in a modern context. There’s a lot of camaraderie that goes along with that and you make lifelong friends throughout it. While you may get in, you may go through and you may find out it’s for you and want to do it for the rest of your life. You may find out it’s not for you but there’s a lot of things that come along with it that you may not necessarily realize you’re coming with it. They’re very, very advantageous. Chris: Very cool. Well, Jeff I really appreciate you taking the time from your busy schedule to meet with us today. I know the Fourth of July weekend is coming up here. On that note, on behalf of all the listeners and on behalf of myself thank you so much for your service and all that you’ve done for this country and for defending freedom in general. We really appreciate it. Thanks so much for giving us some insights into the career of a Naval Aviator and a submarine hunter. Really appreciate it. Jeff: It certainly was nice to sit down and talk with you, Chris. It’s a pleasure to do what I do. It really is because I’ve got a lot of people that will come up to me occasionally and thank me. I say, “Hey, it’s a pleasure to do; to do what we do.” It’s a good job. It’s a fun job. Well, it’s not always easy. It’s not nice to be away from our family for six and a half, seven months at a time when I go to deployment. It’s really worth it. Chris: Great. I really appreciate it and again, thanks so much for joining us on this episode. I just can’t thank you enough. It’s been a really good one. Appreciate it. Chris: Alright, talk to you soon, Jeff. See you. Jeff: All right. See you, Chris. Chris: All right, a huge thanks goes out to Jeff for joining us on this episode of AviatorCast. I know that as I started to get into his story and learn about him more, get to know him more, I realized that there was adversity that he faced as well. Jeff is a great example of what it takes to take control of your destiny if you want to see it that way where as you guys remember from his story, he wasn’t doing super well in college. He was focused on soccer which is never a long-term career even for those that are really good at it and ended up saying, “Hey, you know what I’m going to do with my life?” He put things in action. He put things in motion and eventually became a Naval Aviator. That is no small thing. I think it’s a lesson for all of us, myself included that we need to come up with a plan of action for the things that we want to do and for what we are passionate about. I really love Jeff’s story, turned out really cool. I actually didn’t expect that when I initially booked him to be on AviatorCast. Jeff, thanks a million for being candid about your story. I’m so excited for you and for learning this P8 and for getting into the procedures more and just enjoying that process. It seems like it’s a pretty unique process to go through that with getting a new aircraft in your fleet and I hope you continue to enjoy your work and the diversity of things that you get to do. I’d imagine that you are the best pancake and barbecue chef there is, in the Navy at least, in those aircraft they’re flying. Again, thanks so much for joining us on the show, Jeff. I really appreciate it. A big thanks goes out to the Angle of Attack crew for all they do to make this episode possible week after week. These guys work on a lot of projects outside of AviatorCast. They don’t really work directly on AviatorCast because that’s my baby. It’s something that I do for fun. Obviously you guys aren’t being charged for this or anything and I’m not even charging for the t-shirts that are being sent out. It’s just something that I love to do for the community and just bringing more people into aviation. These crewmembers at Angle of Attack are behind the scenes doing a lot of the video production that we do here at Angle of Attack and some of the distance learning. There’s a lot of stuff we do behind the scenes in our moneymaking business that these guys take those tasks and run with them, so you and I can just have fun like this each and every week. They really are awesome and deserve a shout out. I give them a shout out at the end of each and every episode. Last but certainly not least, you, the listener, this really wouldn’t be possible without you. Thank you so much for joining us each and every week. You guys are awesome. Thanks for leaving a review on iTunes. So many of you do that and I really appreciate it, really boosts us up. I’m trying to do my best to increase the visibility of AviatorCast, to do great and new things. I hope here and over the next few months that I’ll be able to continue that process. I have some cool things in mind. We’re just going to keep trying things out, keep trying to figure out how we get this message out there, how we stay passionate about aviation and just continue this process. Thank you for being part of that community and part of that process. You guys are awesome. If you ever have any questions, if you ever want to give me a shout out or anything, I’m always available at me@aviatorcast.com. It would be great to hear from you guys. Join us next week. I’m not too sure who will be lined up for that episode but there is a lot coming up. We’ll have that episode and then I will eventually be in Oshkosh here in just several weeks where I plan to do a lot of interviews this year. I have a mobile set up this year, so I’m going to be on the move interviewing different people that only I can get live. I love to get an interview with like a World War II aviator, if you will, a different diversity of different people. I hope at that time we’ll have a lot of new stuff to share here on AviatorCast. I’m really hoping to also have some AviatorCast t-shirts there at Oshkosh that I can share with some of you. That’s it, guys. Let’s wrap this up. Until next time, throttle on!